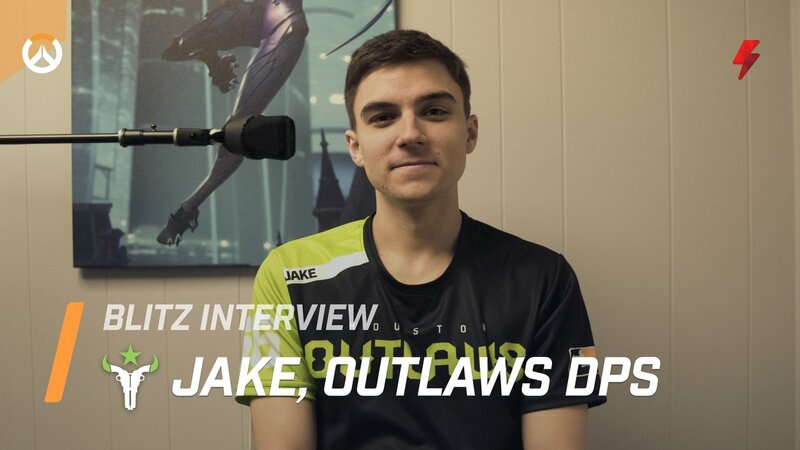 We sat down Houston Outlaws DPS, Jake, to chat about Mercy and Junkrat nerfs, problems with 2CP, and some things fans don't know about him. What's something you think fans might not know about you? I think people might get the impression from my stream or just whatever just their impression of me that I'm like really extroverted because I like to talk a lot, especially when it's about the game. But, I've always been a very introverted person and I always liked time alone and I never feel really relaxed unless I'm by myself. So, for me, that's probably the biggest thing the fans might not know. You get me talking about the video game, I'll talk all day. I love it. It's my passion and I'm super excited about it. But, on other topics or in other areas of life I'm more quiet and reserved. Thoughts on Junkrat's PTR changes? I mean I think the nerf is good because I like the way that they nerfed the character. It was very skill-based. Like, you can still theoretically get exactly the same amount of value out of Junkrat if you're perfectly accurate. Which is unrealistic, of course. It is still a nerf. I think the more important change is the Mercy nerf. Junkrat, as a character that really thrives with Mercy, that like has a ton of synergy with that character. So I'm a little sad that they nerfed Junkrat before testing the waters with the Mercy nerf. I kind of think that Junkrat's probably going to be totally irrelevant. After this patch is borderline unplayable just because Mercy is not going to be as strong. If they tone back the Mercy nerfs and Mercy continues to see play, I think Junkrat will be absolutely fine. It's not like his kit will be a problem. The problem is fitting him in without a Mercy is kind of unjustifiable. Do you think the Mercy nerfs on PTR are too heavy-handed? I really wanted to see at least like one of the three nerfs rolled out one at a time. But, I think Blizzard's idea is to hit her very hard initially and then bring her back to a position that they feel is more reasonable and balanced. So, I think for the community - definitely is important. If you think that these nerfs are a little heavy-handed, which I think the totality of them Mercy nerf is a little much. Even though she is quite overpowered. I think she's going to be really weak if all those nerfs go live. So I think I'd like to see maybe just one or two of them going live. So, definitely something to check out on the PTR and get a feel for. But, just first glance is that the reduced mobility from the 50 percent Guardian Angel Slow on top of having no fast Res's in Valkyrie and only 1 Res to boot. I mean that's a like really across-the-board hit on Valkyrie and I think that ultimate is really the thing that's been keeping Mercy an incredibly relevant character. So, hitting the ultimate that hard is going to be definitely game-changing. I think I think there might been a little bit of an overstep. Why should fans root for the Houston Outlaws? I think the number one reason for the Houston Outlaws is that we're the team that's setting out to prove that it can be done without Koreans. That it's not absolutely necessary that you pick up Korean players in order to win in the Overwatch League. I think that almost every team has sort of come to accept that, "Oh, we have to have at least a few Korean players on the roster or else we'll never be as good. I think that having the Korean coaching staff in TaiRong and HyeonWoo has been invaluable for us and since they've been here, we've definitely made leaps and bounds in our performance in our practice. So, I think we get a lot of that edge from them, but we're still doing it with Western players - which excites me because for a long time people had the assumption that basically any game that's popular in Korea will be dominated by Koreans. And maybe that is the case. But that doesn't mean that an individual Western player or an individual Western team can't work just as hard and commit just as hard to the game and find just as much success. How do you think that's going so far? Because you did just face off against a Korean roster (NYXL). I think we knew that this was going to be probably the hardest match that we played so far in the season. I mean obviously the second match where we were we definitely thought that they were much stronger than Excelsior. Or rather, Excelsior were much stronger than Philadelphia Fusion. So we knew that this was going to be a much tougher match. I think we played a lot better today than we did against the Philadelphia Fusion. We felt really disconnected and honestly just not warmed up against the Philadelphia Fusion. We played better today and made a few small errors that ended up being really costly. But I think a lot of that comes from our inexperience as a team. You know, sometimes in those very tense moments. We haven't set up defaults for every single map. We haven't set up a full plan for every single map. And I think all those teams that have had previous experience together are definitely going to have an advantage over us in the early part of the season. So our hope as a team is to really you know have a strong, improving trend so that further on into the season we'll be able to compete with those teams be able to defeat them by catching up with them on strategy and tactics. I think we already have the mechanical skill and talent necessary. We just need to make sure that it's channeled in the right way with the right strategy. Why does 2CP seem to be such a controversial gametype? I think the most fundamental problem with 2 CP is that the maps are incredibly defense-sided in the sense that second point is just incredibly hard to take. But the balance of the map is derived from the fact that you can roll on Offense. Like, if you win the first fight cleanly you can very often just completely snowball and just annihilate Second point because of ultimates. So, I think that the possibility that you can win the game in two fights is a fundamental flaw in a game with ultimates. Because when you have ultimate tempo and instantly just free when the second fight with ults, you can cap with like six and a half minutes left or something, and it's really frustrating to be on the other side of that and it doesn't feel... it feels like that that's what you went on Offense. That once you fail that snowball, that your win condition is now incredibly difficult because now they have a really really good chance to full-hold you. So I think that the swingy nature of the map where it doesn't feel like you actually get to get out there and fight with your team sometimes when you just get completely snowballed. Like, it feels like one pick can completely end the map. And I don't think that ever feels good. Even getting that pick, it's not like you think you made the best play ever. You just realize we can abuse this and now this map type is going to cause us to have a free win off of that one play. So I think having any map that's decided or decided to that extent by one play has a deep deep problem in a game with ultimates. What's a possible solution to the 2CP problem? I mean, I think the solution has to be like across the board. I think the most fundamental problem is that the way the maps are balanced is you know they build incredibly defense-sided points but, of course, there's still potential to snowball with a really really fast ultimate tempo. So I'd like to see second points getting nerfed and first points getting buffed for Defense. I think having a little bit of a better shot to hold Defense with maybe a closer spawn point would go a long way in reducing the snowball potential. Because then you'd actually be able to commit to a fight on first point without just being terrified of being rolled out of the game. I'm sure you guys will love to print this one, because it's a pretty controversial topic right now. I think I've been hearing a lot of discussion about women in esports especially women in the Overwatch League and lot of people asking why there are no women signed in the Overwatch League. I think that if you give more time to the people that are currently getting excited about Overwatch, currently coming up on Overwatch, we'll see more of those players matriculate into overwatch league and I'm sure some of them will be women. Because I know that there are women out there working hard on the ladder grinding improving their skills so it's just a matter of time for me.